When Colette Garrigan was a teenager in Liverpool at the turn of the 1980s, her main aim was just to “get out.” The Thatcher years were about to bear heavily on her home city, and the working-class area in Bootle where she and her big Liverpool-Irish family lived was on the slide, as a destructive drug culture took hold. So, with the encouragement of her school art teacher – an unsung hero of arts education called Mr Lloyd – she applied for an arts foundation course at Southport College, took her chance, and was off. Even then, though, she could hardly have imagined a future that would lead her – via Suffolk, Belgium, Paris, and a seven year stay on the French Indian Ocean island of Reunion – to a life as one of France’s leading makers of puppet theatre, a renowned teacher, creator and mentor who is about to take up a major new post as director of pedagogy at the École National Superieure des Arts de la Marionette (ESNAM) in Charleville-Mezieres, the home of what is perhaps Europe’s leading Puppet Theatre Institute, and of an annual festival of puppetry that brings together practitioners from across the globe. 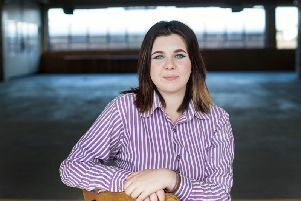 “I’m actually the first ever student of ESNAM to go on to become director of studies there,” she says, “so I’m very proud of that”; and she also says she’s mightily pleased that before she takes up the job, she will be able to fulfil a longstanding promise to appear at Scotland’s annual Manipulate Festival of visual theatre – which opens at the Traverse Theatre next weekend – with her most successful signature show Sleeping Beauty, a solo piece for adult audiences, first seen 12 years ago, which uses images from traditional fairy tales to explore the situation of a young girl growing up in a place very like the troubled Liverpool of her youth, and the perils she faces in the struggle to “wake up,” and take control of her life. Garrigan’s identity as a Liverpool girl has also led her, throughout her career, to work intensively in underprivileged communities and with marginalised groups, from migrants to elderly people in care homes. After completing her course in Southport in 1984, she moved on to Suffolk College in Ipswich, now the University of Suffolk, where she studied theatre, film and television design. Yet she was always drawn to puppet theatre, and unimpressed with the relatively cut-throat atmosphere of film and television work; and in 1988 she went to work at Norwich Puppet Theatre, eventually setting up her own company. She and some colleagues travelled to Belgium and France to check out the European puppetry scene; and when she discovered the Institute of Puppetry at Charleville-Mezieres, she made up her mind to study there by hook or by crook, even though she spoke no French at the time. She came through a week-long audition with flying colours, graduating in 1993 as a fully qualified master of puppetry; and after working for five years around the French puppet scene – “that’s France for you,” she says, “you can work professionally in puppet theatre and make a living, there” – she accepted an invitation to work in Reunion, where she met the future father of her child, gave birth to her daughter in 2001, and worked with some of the island’s most underprivileged and poverty-stricken communities. “The thing about puppetry,” she says, “is that it gives you that distance that I think I’ve always been looking for in my work. It means that you can tackle the most hard-hitting subjects, but always with a sense of distance and poetry that transforms the experience, and maybe helps people to move on. I’m so impressed with Simon Hart who runs Manipulate, because he has had the nous to get out onto the international circuit and to see work with that quality, and bring it back to Scotland; he’s got vision, and he’s hoping to encourage a whole new generation of visual theatre-makers in Scotland to make work in that spirit.